We haven’t had much snow in these parts this year so, since it finally snowed while I was here, I thought I’d take some pictures around the property. 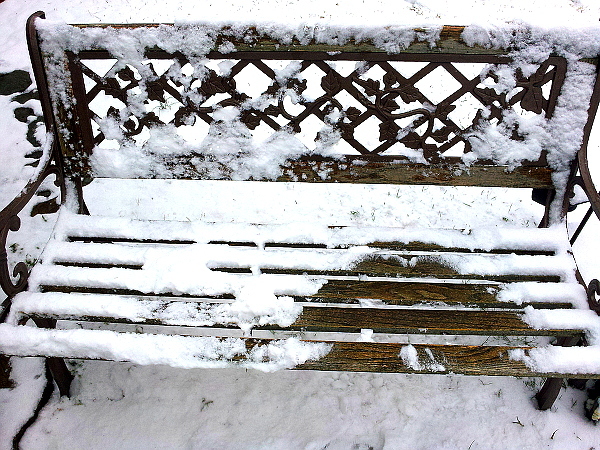 I particularly like this one of my old bench. I’m not sure why, but I like it. That said, I decided I would post it on my blog as a writing prompt and see what you have to say about it. No contest or rules. Write as much or as little as you have to write about it. If it’s only a few lines, feel free to leave it in the comments below. If it’s longer than would be comfortable for a comment, post it on your blog and leave a link to it in the comments (either way, feel free to leave a link to your writing blog on this post!). Are you certain that doesn’t work?! lol My main character was starting to remind me of Bella from Twilight – you know, minus the vamps and wolves. Too whiney.